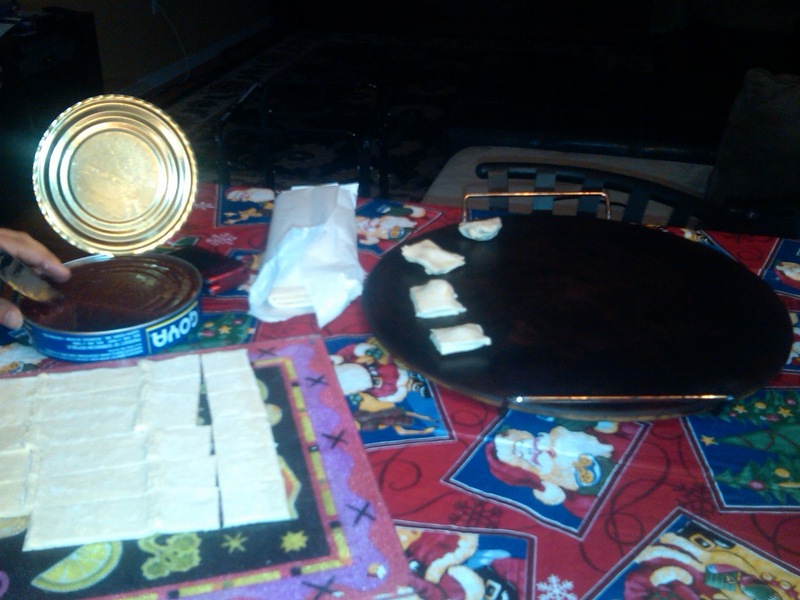 This past week my sister-in-law invited me over to enjoy a Puerto-Rican dinner prepared by her mother. What a treat! Guava & cheese, pernil (roasted pork), rice with beans & pumpkin, tostones and pastillos de guava (pastries filled with guava paste). Sra. 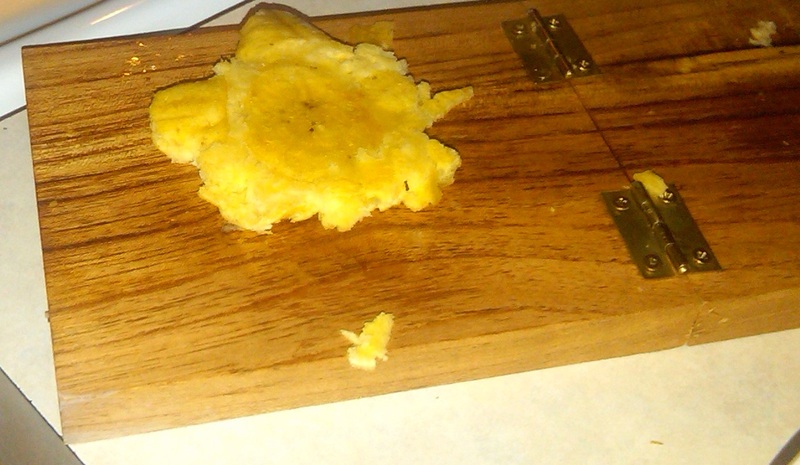 Maldonado graciously taught me to make the tasty little tostones - I have a new favorite snack. Tostones are made from green (unripe) plantains commonly found in the fresh fruit department of a grocery store. 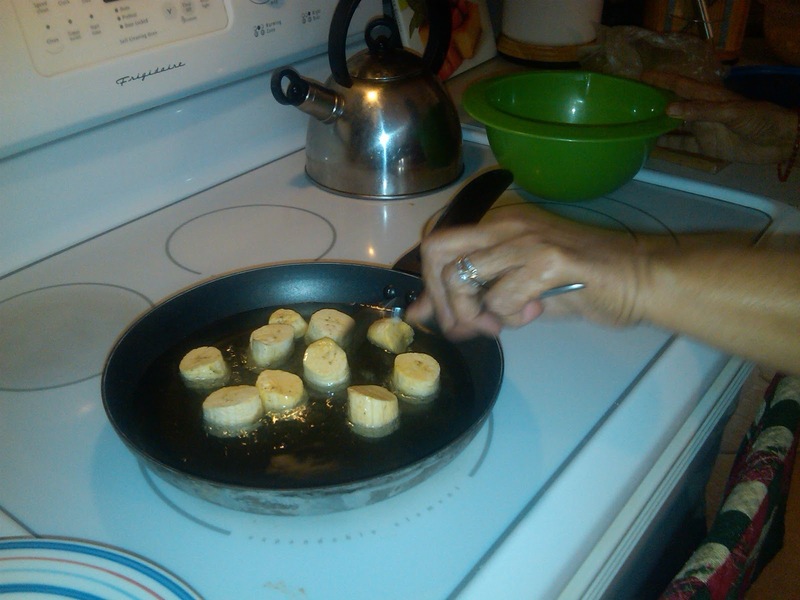 The peeled plantain is sliced into 1 inch thick slices, fried in hot oil until they turn golden-yellow (about 1-2 minutes on each side), and then removed from the oil and patted with a paper towel. Once the excess oil has been removed, each slice is squished flat with a "tostonera" (or any kitchen utensil that has a large enough flat surface) and sprinkled with Adobo seasoning. The plantains are then fried once again until they are crisp and golden brown. They are immediately served with a garlic dipping sauce (olive oil, minced garlic, dash of Adobo seasoning, splash of vinegar). 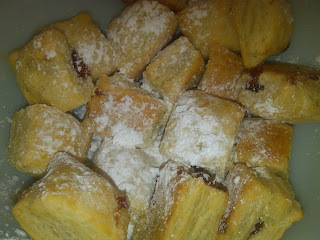 Roll out puff pastry dough and cut into small squares. 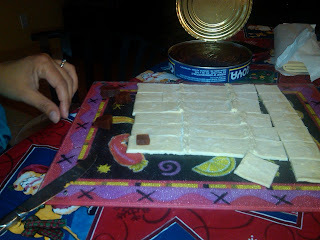 Place a cube of guava paste in the middle of pastry square. Place another pastry square on top and pinch together. Bake at 350F until puffed and lightly browned. Sprinkle pastillos with powdered sugar. Enjoy! Con un corazón agradecido, besitos a la Sra. Maldonado y sus hijas. 25JAN11 Update: I've linked this posting to Today's Creative Blog. Click on over to see many other ideas from those who have got Their Craft On too.